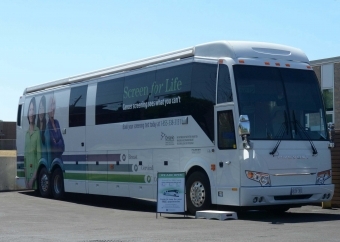 Starting in November, the Hamilton Niagara Haldimand Brant Regional Mobile Cancer Screening Coach will begin offering free, regular cancer screening services at Bridges Community Health Centre locations in Fort Erie and Port Colborne. The Coach has been providing cancer screening services in St. Catharines since July 2017. Expansion to Fort Erie and Port Colborne is part of the Regional Cancer Program’s efforts to increase cancer screening rates among Niagara residents who face barriers to screening. The Coach will bring state-of-the-art breast, cervical and colon cancer screening to Fort Erie and Port Colborne for a full day each month, beginning on November 7 in Port Colborne and November 13 in Fort Erie. Going forward, the Coach will visit Port Colborne the first Wednesday of each month and Fort Erie the second Tuesday of each month. "We are really pleased to partner with our Regional Cancer Program to bring these mobile services to Fort Erie and Port Colborne," says Dr. Julian Dobranowski, Chief of Diagnostic Imaging at Niagara Health and Provincial Head for the Cancer Imaging Program at Cancer Care Ontario. "Screening is a very effective tool for detecting cancer early and improving outcomes for patients. Having these new screening opportunities available for members of our communities complements our local services and reaches even more people." Port Colborne and Fort Erie residents are encouraged to see their regular healthcare provider to arrange for cancer screening. For those facing barriers, the Coach offers breast, cervical and colon cancer screening through the Ontario Breast Screening Program, Ontario Cervical Screening Program and ColonCancerCheck program. Coach services also include smoking cessation referral. Barriers could include not having a family doctor or nurse practitioner, or facing transportation, cultural, or other personal barriers to participating in screening. Satellite OBSP breast screening services are no longer provided at the Port Colborne and Fort Erie sites given concerns about equipment deficiencies that were irreparable, outdated film technology and low patient demand. An increasing number of women in these communities were transferring to Niagara Health’s OBSP centres in Niagara Falls, St. Catharines and Welland sites for routine breast screening. These centres offer more advanced digital technology, which is consistent with provincial mammography quality guidelines. The Mobile Coach screening equipment is also digital. Mammograms are recommended for women ages 50-74 every two years and Pap tests for ages 21-69 every three years. The Coach’s registered nurses also distribute an easy take-home test that screens for signs of colon cancer. Men and women, ages 50 to 74, are encouraged to take this test every two years. The Coach will be at Bridges’ Port Colborne location, 380 Elm St., on the first Wednesday of each month starting Nov. 7, from 9 a.m. to 3 p.m. It will be at Bridges’ Fort Erie location, 1485 Garrison Rd., on the second Tuesday of each month, starting Nov. 13, from 9 a.m. to 3 p.m. Residents can book an appointment by calling 905-975-4467 or 1-855-338-3131, or drop-ins can be accommodated on a first-come, first-served basis. The Coach has been serving under and never screened residents in Hamilton since 2013. It also serves Six Nations of the Grand River and Mississauga of the New Credit First Nation territories. "Expansion into Niagara was facilitated by collaborative partnerships between the Regional Cancer Program and Niagara Health, Niagara Region Public Health, Niagara’s Community Health Centres, Wellspring Niagara and the Indigenous Health Network," says Carol Rand, Director, Regional Cancer Program. The overarching goal is to improve cancer screening rates in the region. 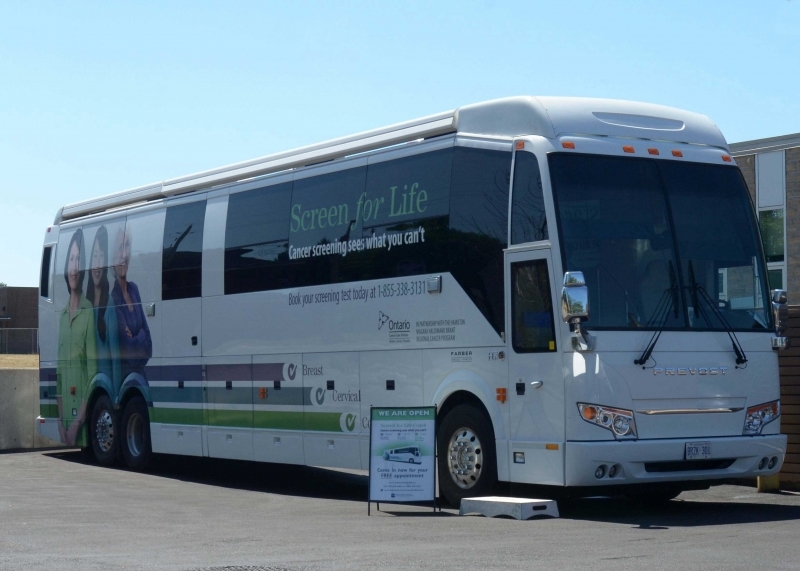 The Coach complements existing cancer screening services in Niagara. These services include three OBSP screening sites and endoscopy services as part of ColonCancerCheck at Niagara Health’s Niagara Falls, St. Catharines and Welland sites; access to Pap tests and the FOBT through local healthcare providers. The Coach’s monthly schedule and a full listing of OBSP locations in the region is available at hnhbscreenforlife.ca.